NTT Inc. - Ultrasonic Testing of Welds: Why is Testing Important? Ultrasonic Testing of Welds: Why is Testing Important? Ultrasonic weld testing is a form of nondestructive testing that relies on the propagation of ultrasonic waves on the material or object tested. It is called NDT (non-destructible testing because it does not cause damage to the investigated item. The most familiar applications of UWT are in medicine, the most common example being ultrasound scans in obstetrics. 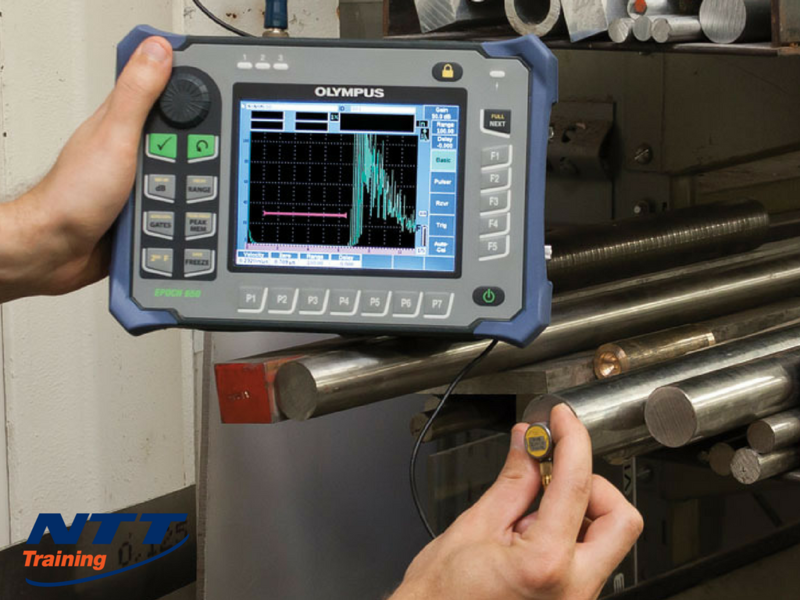 Other uses of ultrasonic testing include industrial work to determine the thickness of a length of pipe to assess corrosion, or to assess the integrity of a weld on a piece of machinery. Ultrasonic involves directing beams of high-frequency mechanical vibrations toward the object undergoing the test. This energy passes through the material undisturbed until it encounters a discontinuity. Such beams can be used to detect flaws or to determine the thickness of a material. Why Is It Called Ultrasonic Testing? The frequency of a wave is defined as the number of oscillations per second. The unit of frequency is called a hertz (Hz). Sound waves that are audible to the human ear, such as music or the spoken word, have frequencies in the range of 20-20,000 Hz. Ultrasound waves have frequencies that are higher than 20,000 Hz. Examples of ultrasonic waves include the type of sonar used by bats for navigation, or the vibration frequency of a quartz crystal. The human ear cannot detect these waves. How Can It Be Used in the Workplace? What Are the Safety Issues Around UWT? Thermal or chemical burns, depending on the substance inside the vessel. Sudden expansion of the contained gas or liquid under pressure causes a blast. The vessel ruptures, causing fragmentation damage and injury to persons. Defective welds cost lives. In July 2011, two people died as the result of a crash involving a Wright “B” Flyer Replica during a test flight. Crash investigators concluded that the flight crew lost control of the aircraft because of a partial loss of engine thrust. The root cause of the disaster was a crack in a weld on the left propeller shaft. A shoddy weld was also at the heart of the deaths of two construction workers in 2008, when a 200-foot-tall crane broke apart in Manhattan’s Upper East Side. The owner of the crane had secured a contractor, a little-known company from a foreign country that he had located over the internet, to perform a repair on the rig’s turntable. If the job you do, or would like to do, falls into one of the categories mentioned above, then getting some training in ultrasonic weld testing could be one of the smartest decisions you could make, especially if you perform UWT or supervise people who do the work. NTT Training delivers a one-day, hands-on seminar on ultrasonic testing. The seminar teaches maintenance personnel how to operate ultrasonic testing equipment, how to detect flaws and determine material thickness with the aim of maintaining a productive and safe working environment. If you are interested in participating in one of these seminars or organizing a course for your workers, contact the team at NTT Training to arrange an on-site seminar.